The act will take place on Saturday, January 13, starting at 9:00 p.m. in the CERE and will be organized by Los Cansaliebres. 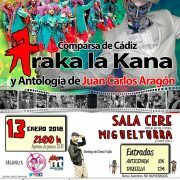 The comparsa Gaditana “Araka la Kana” and the anthology of Juan Carlos Aragón, in pre-carnival 2018 of Miguelturra. 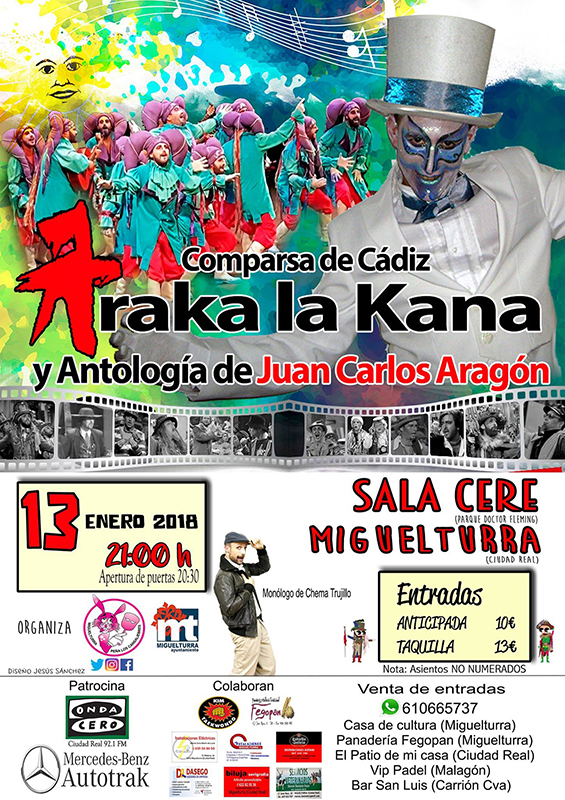 The churriego monologue Chema Trujillo, will intervene during the break of the first act of the churriego precarnaval 2018, whose main course is the comparsa from Cádiz “Araka la Kana” and the anthology of Juan Carlos Aragón. Juan Carlos Aragón, is one of the most famous composers of the Cádiz carnival, in 1999 he won his first prize with the chirigota Los Yesterdays, in 2002 with Los Angeles Caídos, in 2007 with the comparsa Araka la Kana and in 2015 with the Los Millonarios comparsa. Araka la Kana, from the hand of Juan Carlos Aragón Becerra, won the first prize of comparsas at the Teatro Falla de Cádiz, remembering the Uruguayan troupes. This first prize allowed them to make a tour through Uruguay in the month of April, sharing the stage with the Uruguayan comparsa of Montevideo ‘Araca la Cana’ by José María Gatussa Silva. They will also share the stage on June 7, 2007 at the Falla Theater in Cádiz at the Carnival Gala. Tickets can be purchased in advance at the price of 10 euros at the following points of sale: Casa de Cultura and Fegopán in Miguelturra, Patio de Mi Casa in Ciudad Real, Vip Padel in Malagón and Bar San Luis in Carrión. The price at the box office will be 13 euros. The sponsors of the event are: City Council of Miguelturra, Onda Cero and Autotrack Mercedes Benz. While Kim Gymnasium, Fegopán, Alberto Soria Electrical Installations, Miguelturra Installations, Estrella Galicia, Dasego, Biluja and Veterinary Service Mark Pretty, act as collaborators of the event. To the presentation act held in the plenary hall of the Town Hall of Miguelturra, on Thursday, December 4, have attended the celebrations councilman Diego Rodríguez and the president of the Peña Los Cansaliebres Alberto Soria. https://carnavaldemiguelturra.es/wp-content/uploads/2017/12/cartel-araka.jpg 800 565 berna https://carnavaldemiguelturra.es/wp-content/uploads/2017/02/logo.png berna2017-12-04 16:59:092018-05-20 18:49:15The act will take place on Saturday, January 13, starting at 9:00 p.m. in the CERE and will be organized by Los Cansaliebres.